Alrighty, let's breakdown this letter into its bit parts. They are pretty much purporting to be a "government agency," right? They are claiming to be the "Bureau of Tax Enforcement for Orangeburg County"? They indicate that they will "levy in fifteen days?" 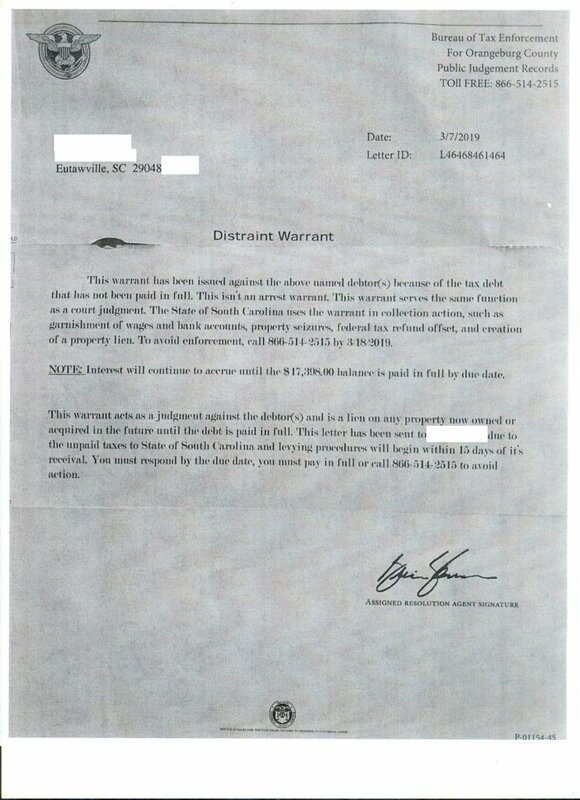 This "Distraint Warrant" letter comes from a tax relief company in Los Angeles called American Tax Solutions. Folks, if people are marketing to you in this deceptive way, don't you think their performance solving your tax problem is going to be suspect? Admittedly, WATAX sent out tax lien mailers from 1989 to 2011, but ours weren't this blatant or misleading! Really! Nonetheless, if you would like your tax problem analyzed honestly and with no pressure to hire us, call us at 1-888-282-4697 or email us a description of your tax issue and we'll contact you.